For a few years, I met his praise with a comment along the lines of, “I don’t do the Grove” accompanied with a sassy sucking of teeth and an eye roll to reinforce my Eastside cool. The irony is that the longer I live in Los Angeles, the more I appreciate the Mid-City destination. (I even rode the trolley last year!) I’ve also grown fond of the Beverly Center. And Santa Monica Place. And Paseo Colorado. And Westfield Fashion Square. Malls are a part of Los Angeles. Our city is an expansive tangle of streets and cultures, and malls are the anchoring hubs, architectural constellations that spell our city out, clichés and all. Malls are where people come together and do this and do that and shop or not. The retro-future leaning Beverly Center, for example, represents Los Angeles’ cultural disparities: It has Forever 21 on one floor and Fendi on another. It has secret pedestrian entrances and bike parking—two big bonuses—too. The building even hugs an oil derrick! 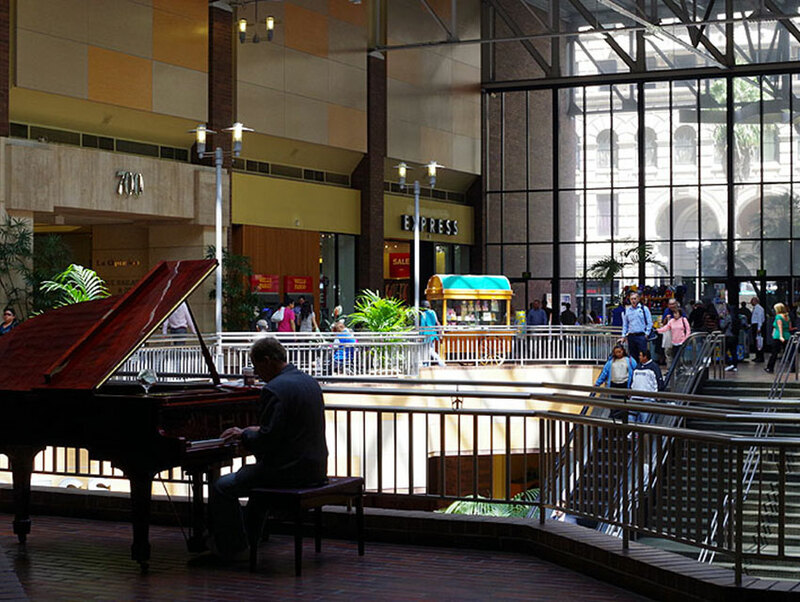 The diverse architecture and services of Los Angeles malls reflects us, too. There are shopping destinations that double as community centers (The Grove, Third Street Promenade, The Americana). There are dated suburban ideals of what cosmopolitan shopping should be (Glendale Galleria, Sherman Oaks Galleria, Burbank Town Center). There are luxe malls where you can valet your bike (Westfield Century City). And there are even malls undergoing plastic surgery in order to stay current (Macy’s Plaza)! Many have served as some of Los Angeles’ most prized ambassadors on film, entering the homes of people all around the world through TVs to say, “In L.A. people live like this. How great!” Per pop culture, there have been heists in our malls (Del Amo Mall in Jackie Browne) and there have been volcanoes around these malls (Beverly Center in Volcano) and these malls have been the stomping grounds for iconic teenagers with covetable everythings (Westside Pavillion in Clueless). Few other cities have shopping centers that double as international landmarks! Malls represent a flaw in our city’s commuter culture, too: Very rarely do people walk to malls nor are they particularly accessible via the Metro system, which is a shame. And too rarely do they support locally owned-and-operated businesses. Still malls are an essential part of Los Angeles’ ecosystem, even as they are an example of our lusty lifestyle—and I love them. I’m an Angeleno that way.